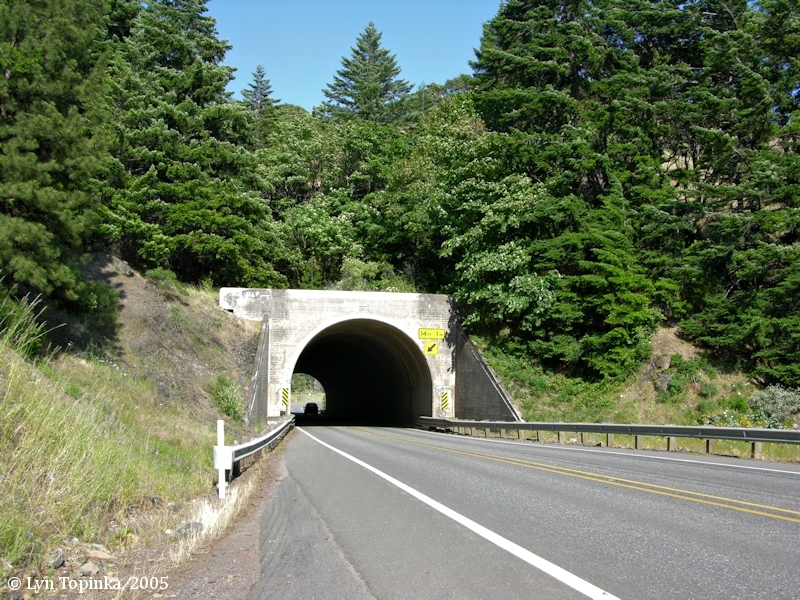 Click image to enlarge Tunnel No.2, Washington State Highway 14, and Railroad Tunnel No.3. View from west looking east. Image taken May 1, 2005. 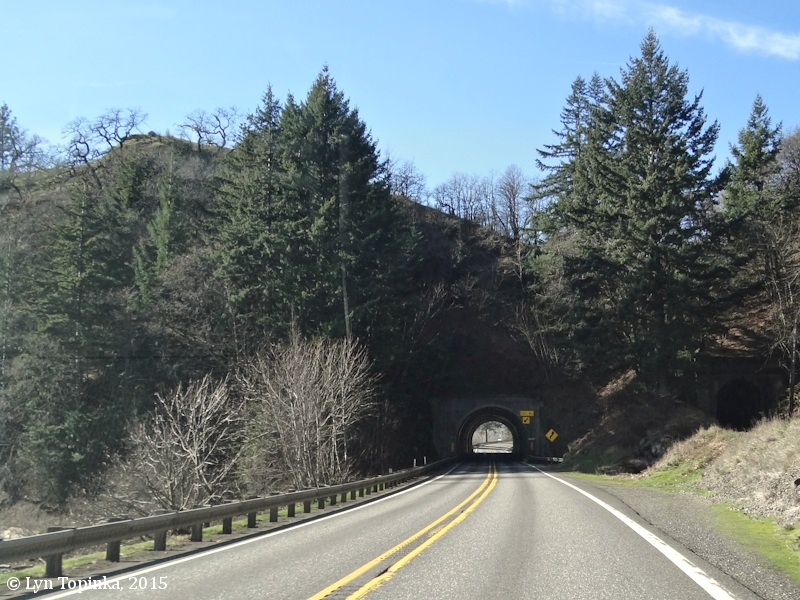 Tunnels and Bridges of the North Bank Highway (Washington State Route 14) and the North Bank Road (Railroad). Washington State Highway 14 traverses the north side of the Columbia River from the Interstate 5 Bridge at Columbia River Mile (RM) 106.5, to the Interstate 82/395 Bridge at RM 291. The majority of this route is a two-lane road. 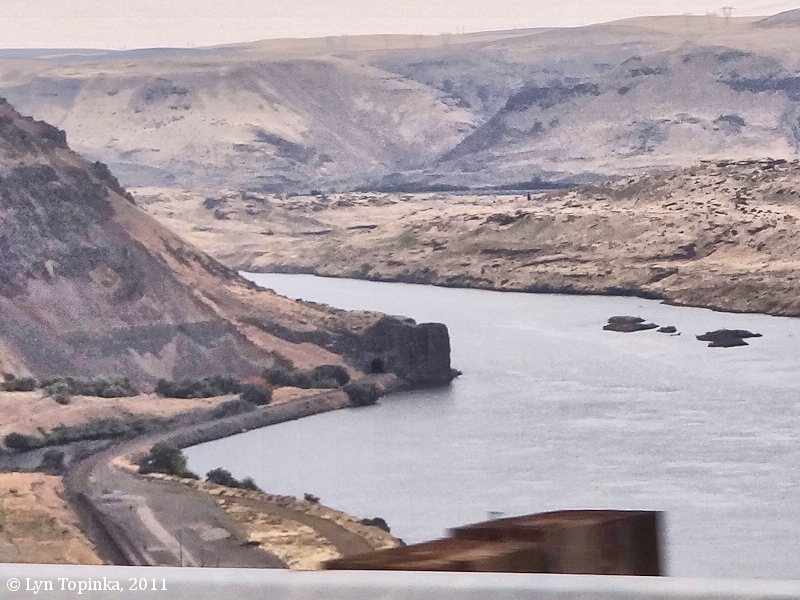 Between Drano Lake and just past Lyle, Washington there are seven tunnels carved through the Columbia River basalts. The first five tunnels are clustered together east of Drano Lake. The first tunnel, Tunnel No.1, begins at the east end of Drano Lake at RM 163.5, with Tunnel No.2 another half mile east. The last two tunnels - Tunnels No.6 and No.7 - are located immediately east of Lyle and cut through the Rowena basalts. Cape Horn Bridge RM 132 Cape Horn Bridge, built in the late 1920s and open for traffic in December 1930. Hamilton Creek Bridge RM 143 Hamilton Creek Bridge. Wind River Bridge RM 154.5 "Senator Al Henry Bridge", Highway 14 bridge over the Wind River, built 1937. The BNSF railroad bridge is on the left. Tunnel 1 RM 163.5 Highway 14 tunnel at the upstream end of Drano Lake, built 1937. White Salmon River Bridge RM 168 295.9 feet Highway 14 bridge over the White Salmon River, steel stringer/multi-beam or girder, three spans, built 1972. 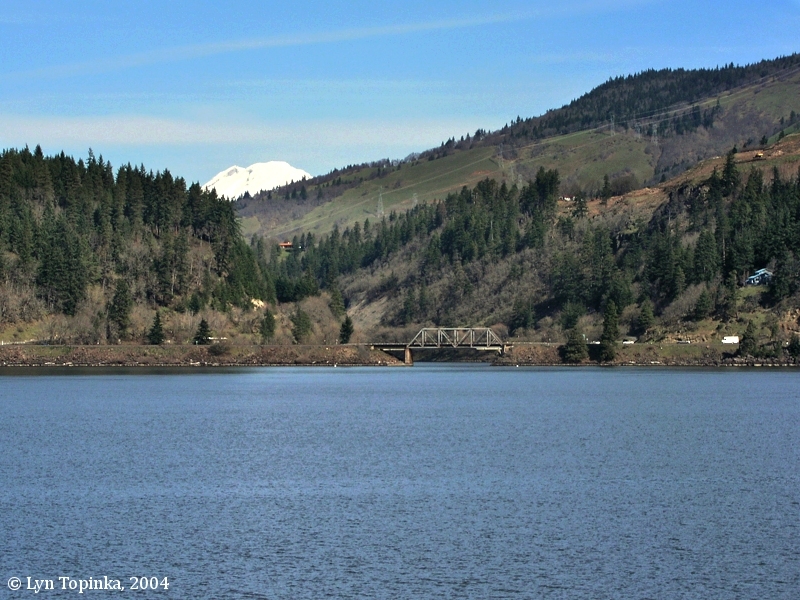 Klickitat River Bridge RM 180.5 265-foot-long concrete arch, arch span is 160 feet. 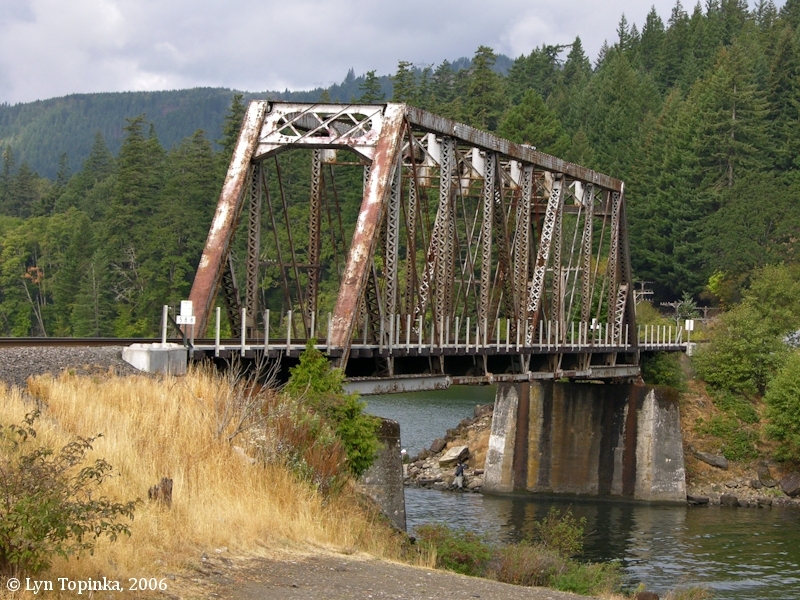 Highway 14 bridge over the Klickitat River, built 1933. Tunnel 6 RM 181.5 389.1 feet East of Lyle, Washington, built 1933. Tunnel 7 233 feet East of Lyle, Washington, built 1933. 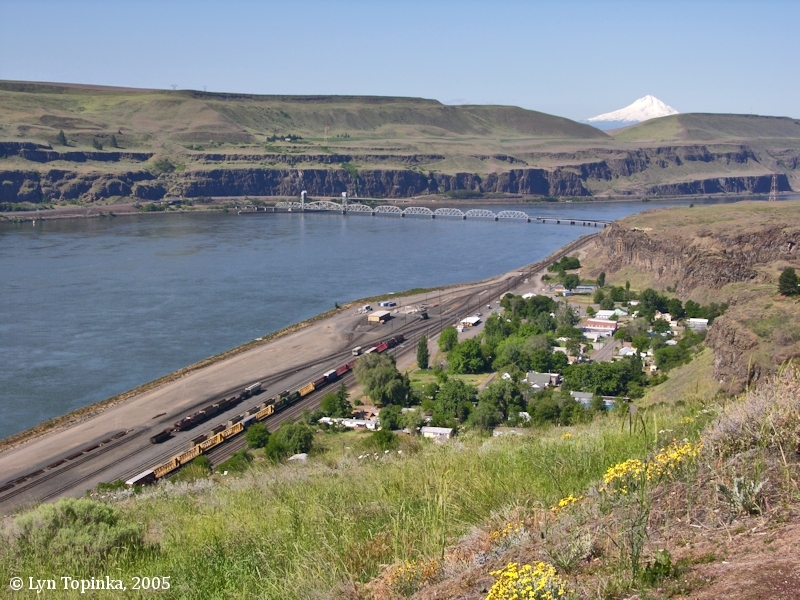 In the early 1900s the Spokane, Portland & Seattle Railroad built eleven tunnels on the north side of the Columbia River between Washougaland North Dalles. 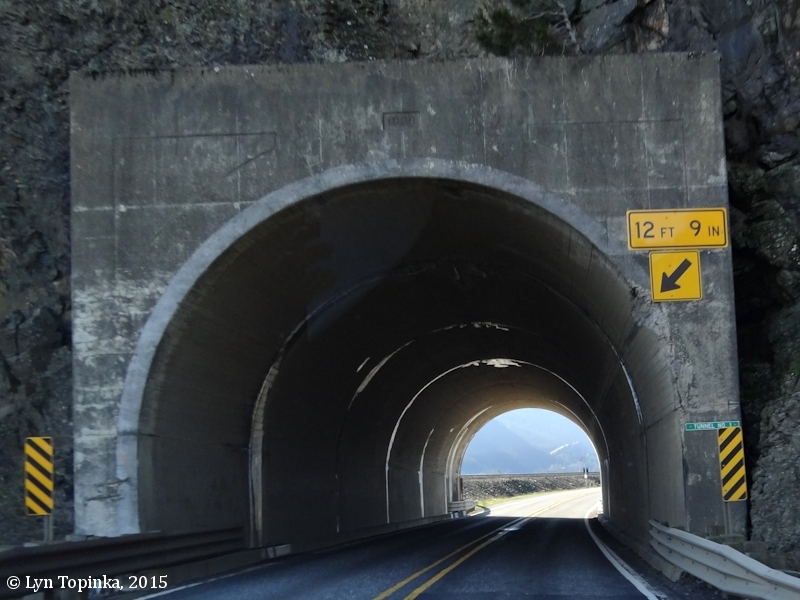 The longest was Tunnel No.1, the Cape Horn Tunnel, at 2,382 feet. The shortest was the Drano Lake Tunnel at 122 feet. 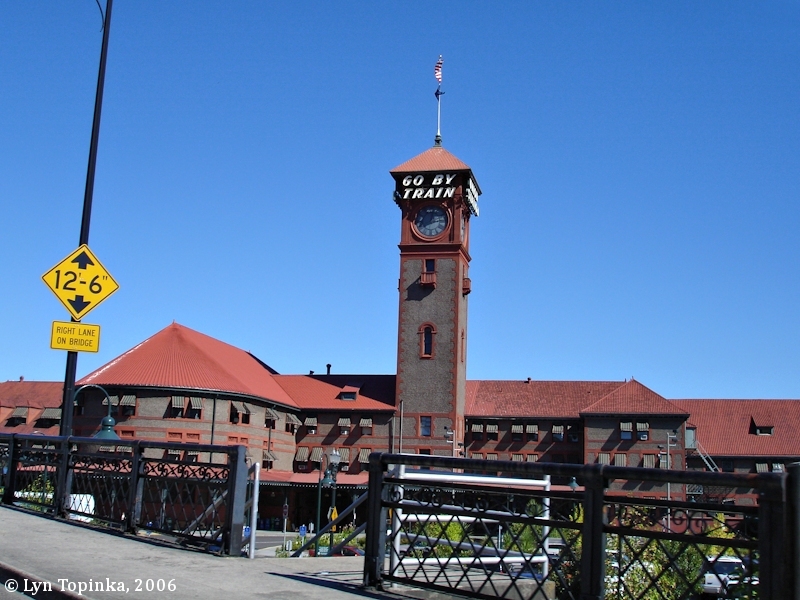 The Spokane, Portland & Seattle Railroad (SP&S) was the dream of Sam Hill, who controlled the Great Northern and the Northern Pacific Railroads. 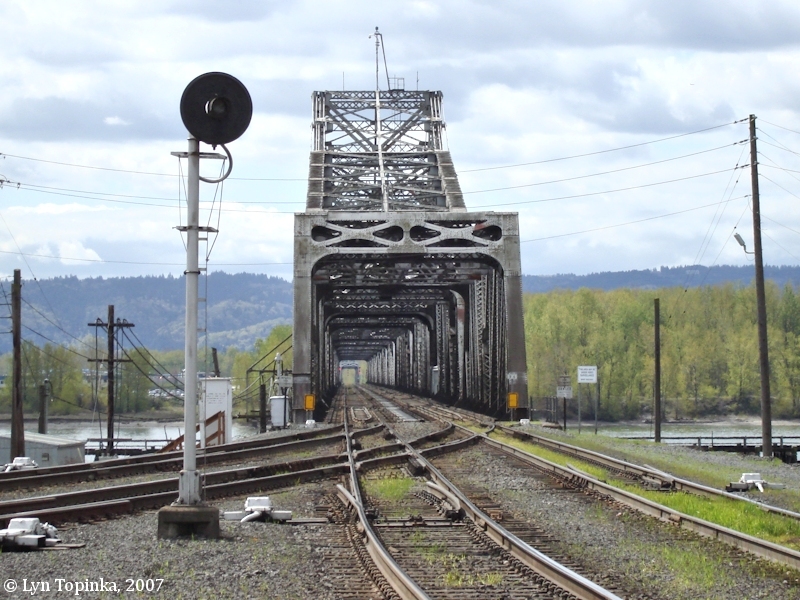 Hill built the SP&S line to "protect his business interests in the Pacific Northwest" against the competing Union Pacific line on the Oregon side of the Columbia. The Northern Pacific and Great Northern shared construction costs and ownership of the SP&S line. The SP&S line officially opened on March 11, 1908, and existed until it merged with the Burlington Northern line in 1970, eventually to become the Burlington Northern Santa Fe (BNSF). 106.5 Crossing the Columbia River into Vancouver, Washington. 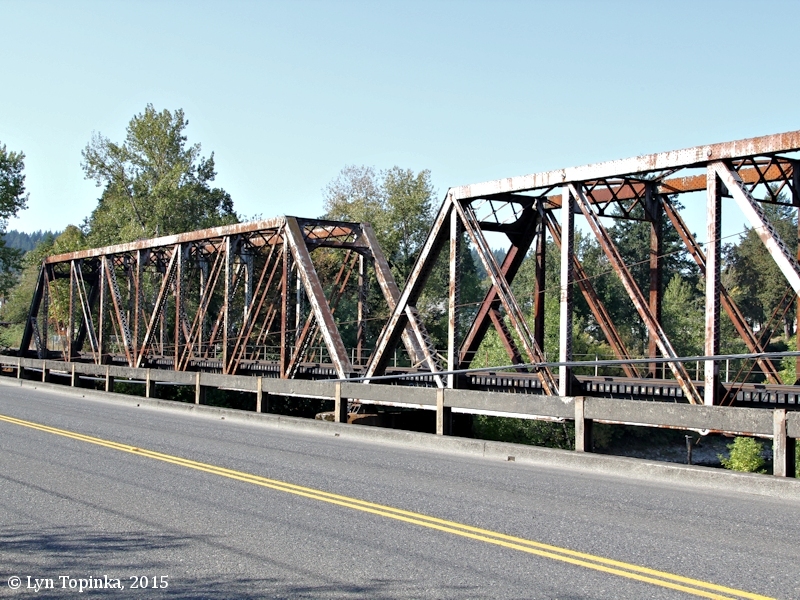 RM 120 550 feet Warren through truss bridge over Washougal River. 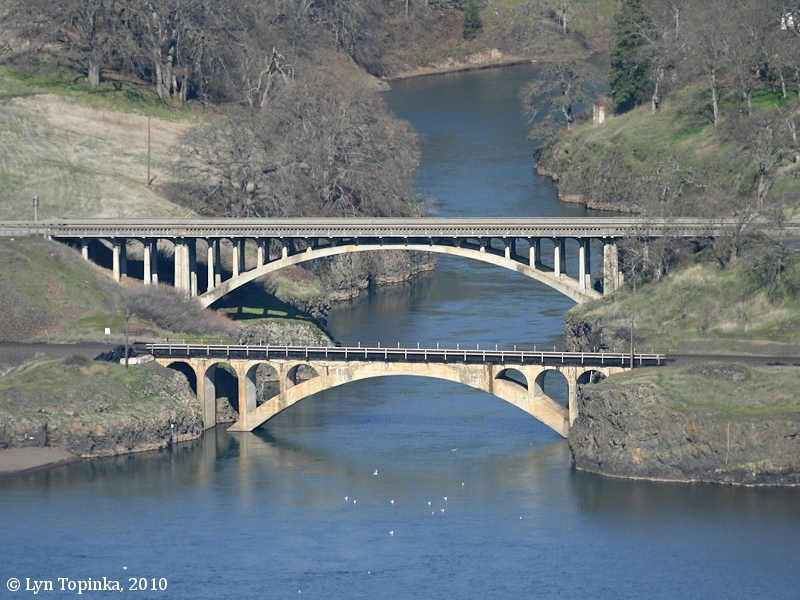 Two 200-foot-long spans, built in 1908, slated to be removed/demolished (2015). 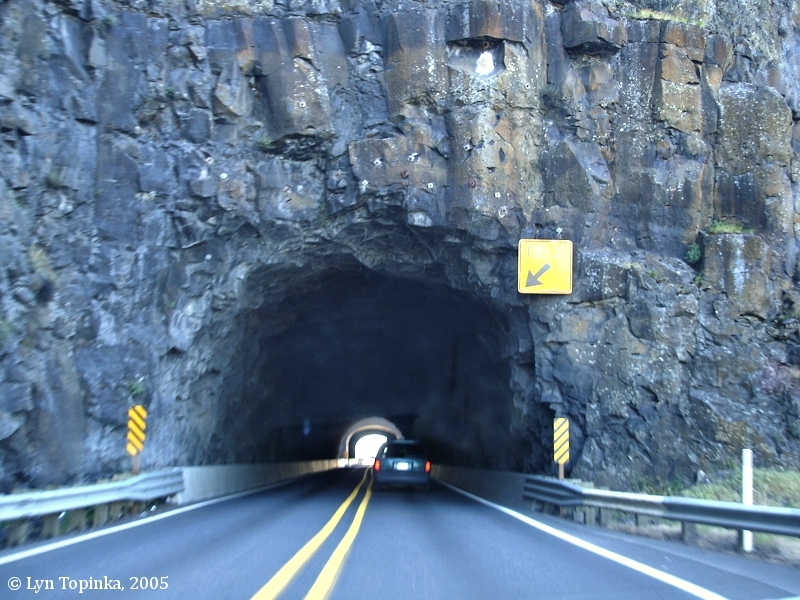 Tunnel 1 MP 34.7 2,382 feet "Cape Horn Tunnel", through massive basalt outcrop known as Cape Horn. Hamilton Creek RR Bridge RM 150 Pratt through truss bridge over Hamilton Creek, North Bonneville, Washington. Tunnel 1.5 RM 147 Bonneville Dam area, built 1977. Rock Creek RR Bridge RM 150 Warren through truss bridge over Rock Creek, Stevenson, Washington. 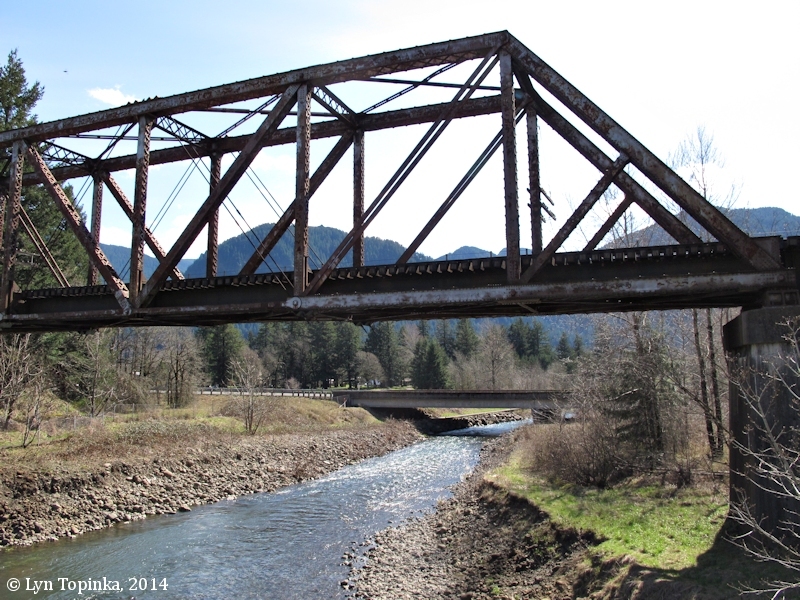 Wind River RR Bridge RM 154.5 Pratt through truss bridge over the Wind River, Skamania County. Little White Salmon River RR Bridge RM 164 Pratt through truss bridge at the Little White Salmon River / Drano Lake outflow, Skamania County, built 1907. RM 163.5 122 feet "Drano Lake Tunnel", upstream end of Drano Lake. RM 164 416 feet "Blum Tunnel". RM 164 267 feet "Severson Tunnel". RM 165 394 feet "Owl Rock Tunnel". RM 165 657 feet "Alligator Rock Tunnel". White Salmon River Bridge RM 168 Pratt through truss bridges over White Salmon River, Klickitat County, Washington, built 1911. Tunnel 7 MP 82.8 966 feet "Hewett's Tunnel", upstream of Major Creek and Hewett Lake. Tunnel 8 MP 83.1 755 feet "Anderson's Tunnel", Chamberlain Lake Rest Area, built 1908. Tunnel 9 MP 83.3 392 feet "Woldson's Tunnel", built 1908, nice views from Chamberlain Lake Rest Area. Tunnel 10 MP 83.5 575 feet "Jackson's Tunnel", built 1908. 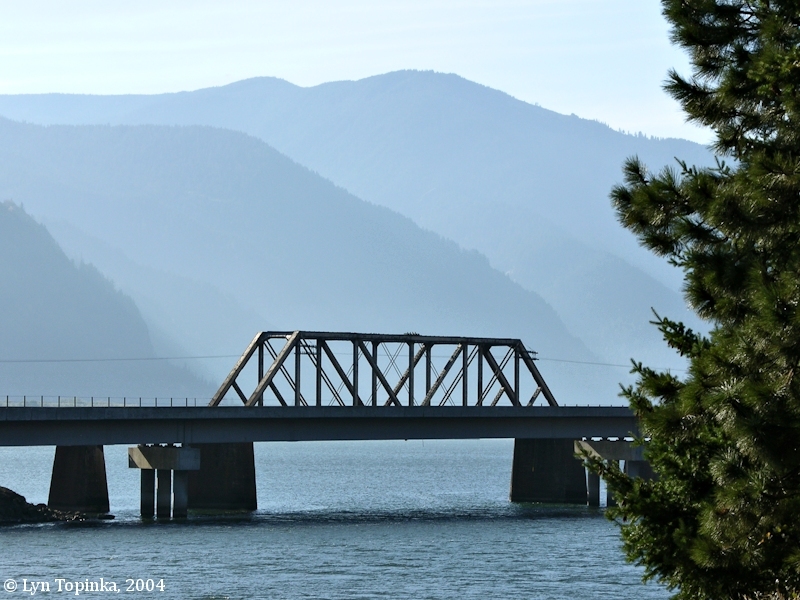 Klickitat River RR Bridge RM 180.5 200-feet-long concrete arch bridge, concrete arch is 160-foot. 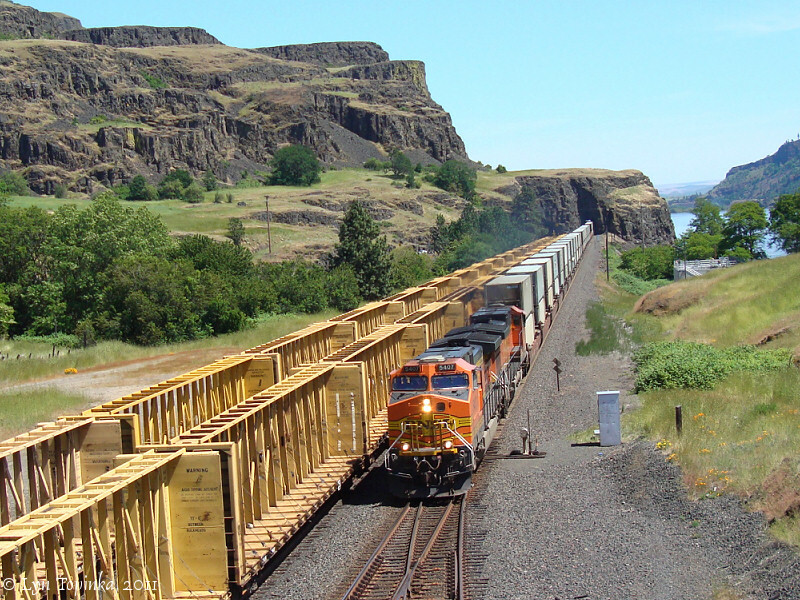 BNSF bridge over the Klickitat River, built 1908. RM 181.5 269 feet Upstream of Lyle, Washington, built 1908. 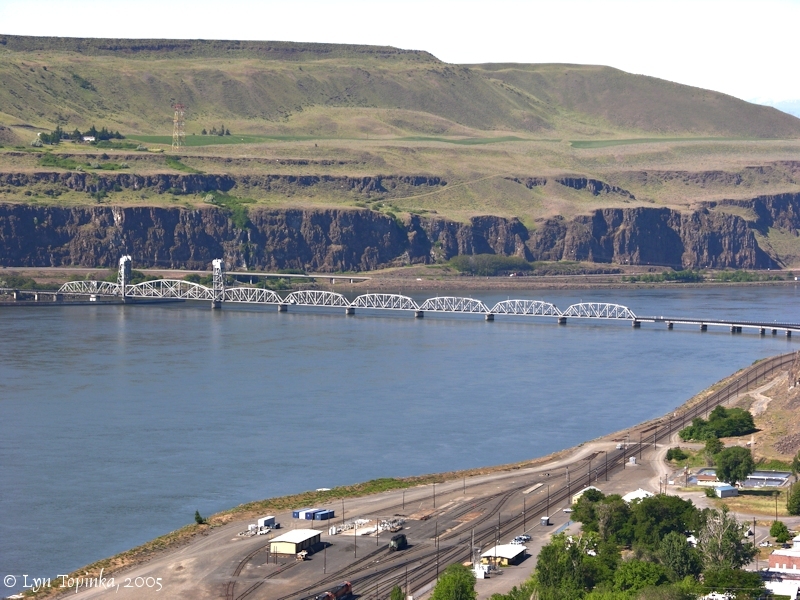 Oregon Trunk Line Bridge RM 200 Parker trusses with lift span crossing the Columbia River from Wishram, Washington, to Celilo, Oregon. Originally built 1912 as fixed span structure. Swing span added during construction of Celilo Canal and a lift span added 1950s during construction of The Dalles Dam. 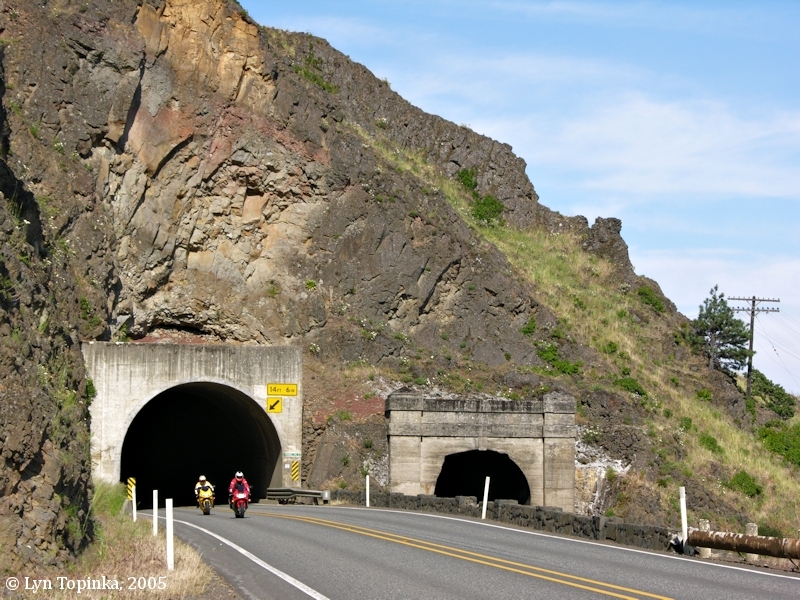 Tunnel 12 385 feet East end of Wishram. Tunnel 13 almost 700 feet Abandoned Tunnel from tracks being realigned due to the McNary Dam, Plymouth, Washington, built in 1907 and abandoned in 1951. 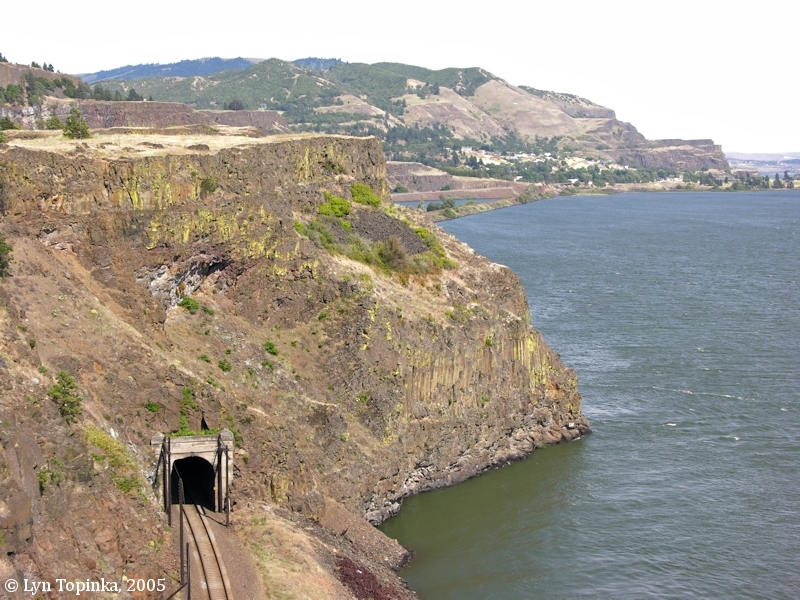 The Cape Horn Railroad Tunnel (Railroad Tunnel No.1) at 2,382 feet, is the longest of eleven tunnels built along the north side of the Columbia River for the Spokane, Portland & Seattle Railway. The tunnel cuts through the massive basalt flow known as Cape Horn. 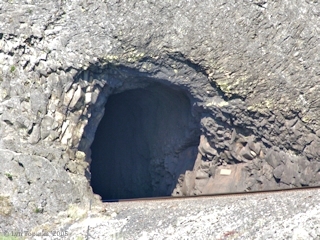 Click image to enlarge West Portal, Railroad Tunnel at Cape Horn. 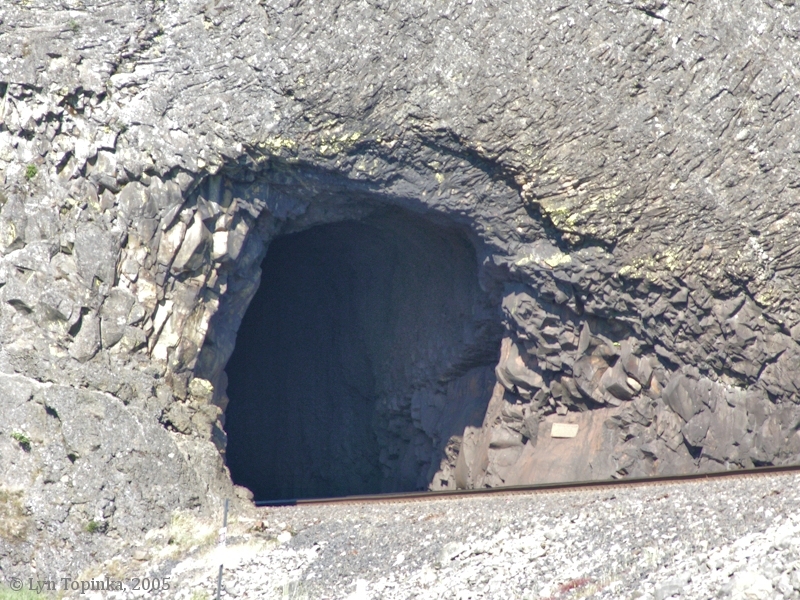 West portal of the railroad tunnel at Cape Horn. View from Bridal Veil, Oregon. Image taken March 6, 2005. 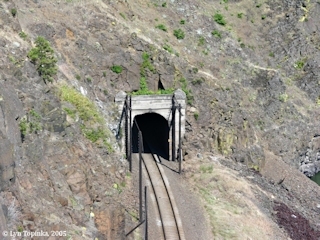 Click image to enlarge East Portal, Cape Horn Railroad Tunnel, with train in tunnel. 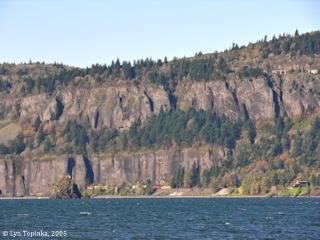 View from Dalton Point, Oregon. Image taken October 22, 2005. 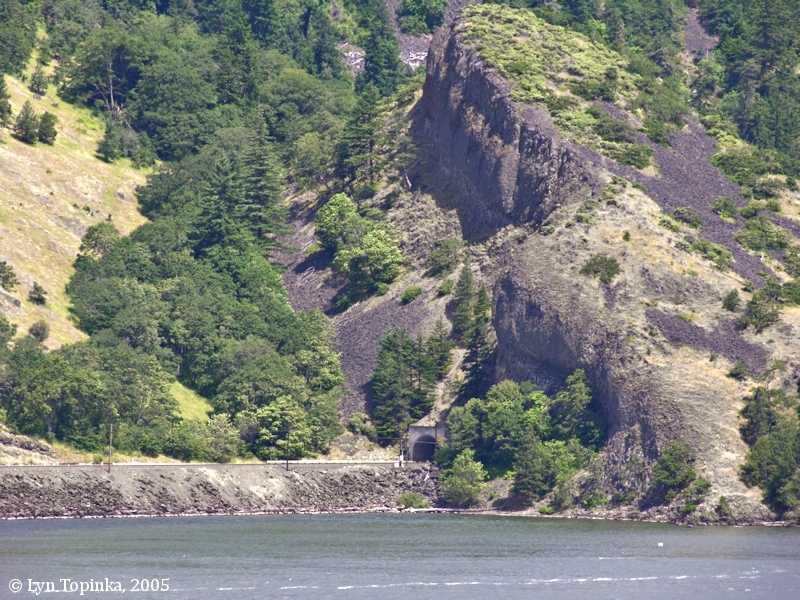 Click image to enlarge Cape Horn Railroad Tunnel, Tunnel No.1, with train in tunnel, as seen from Dalton Point, Oregon. Image taken October 22, 2005. Washington State Highway 14 Tunnel No.1 and Railroad Tunnel No.2 are at the eastern edge of Drano Lake. The Railroad Tunnel is the shortest of the eleven railroad tunnels along the Gorge, measuring only 122 feet. 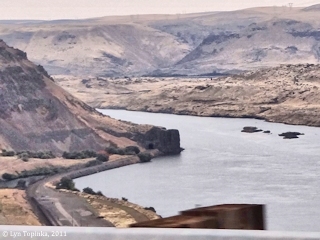 Click image to enlarge Washington State Highway 14 Tunnel No.1 and Train Tunnel No.2, as seen from across Drano Lake. View from west end of Drano Lake. Image taken November 4, 2004. 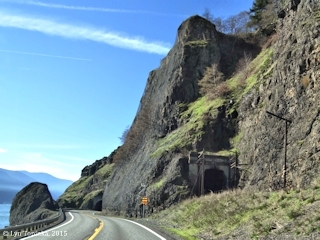 Click image to enlarge West Portals, Washington State Highway 14 Tunnel No.1 and Railroad Tunnel No.2. Image taken June 4, 2005. 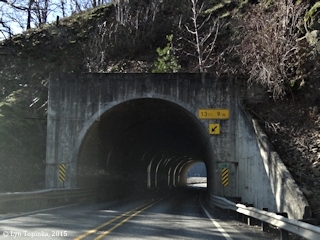 Click image to enlarge West Portal, Tunnel No.1, Washington State Highway 14, Drano Lake. Image taken June 4, 2005. 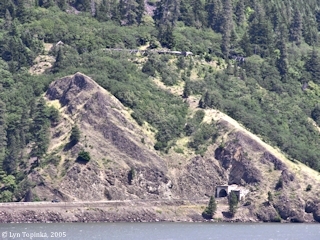 Click image to enlarge West Portal, BNSF Railroad Tunnel No.2, Drano Lake. Image taken June 4, 2005. 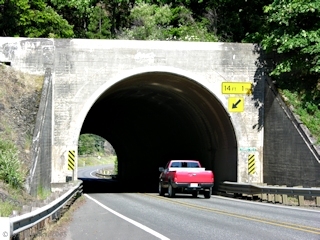 Click image to enlarge East portal, Washington State Highway 14 Tunnel No.1. Image taken June 4, 2005. 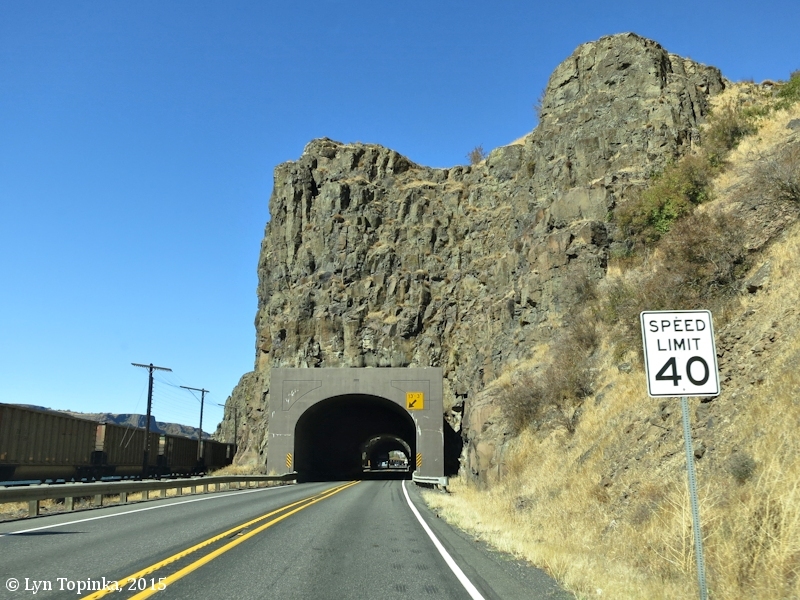 Washington State Highway 14 Tunnel No.2 and Railroad Tunnel No.3 are half a mile further east of the first tunnels at Drano Lake. The date on the arch of the Highway Tunnel says 1936. 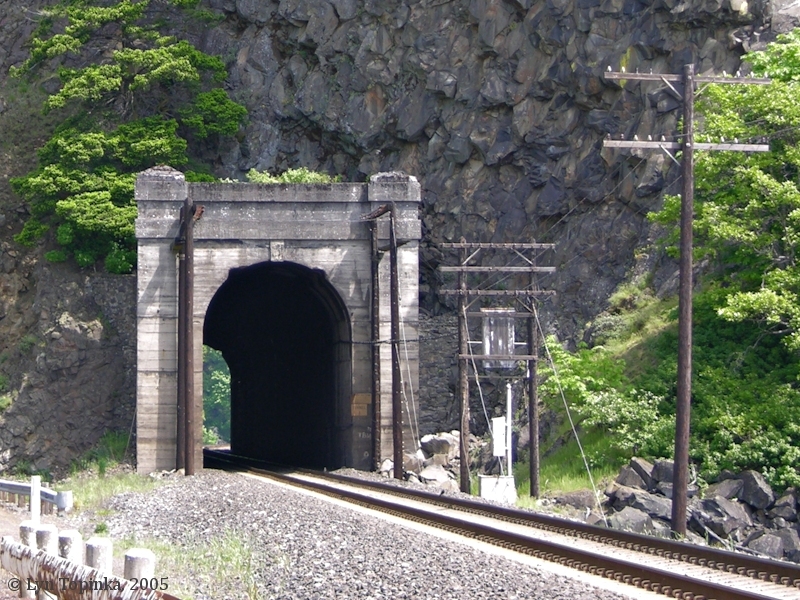 The Railroad Tunnel is known as the "Blum Tunnel". It is 416 feet long. 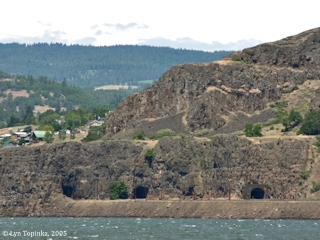 These tunnels can be seen from across the Columbia River at Oregon's Mitchell Point. 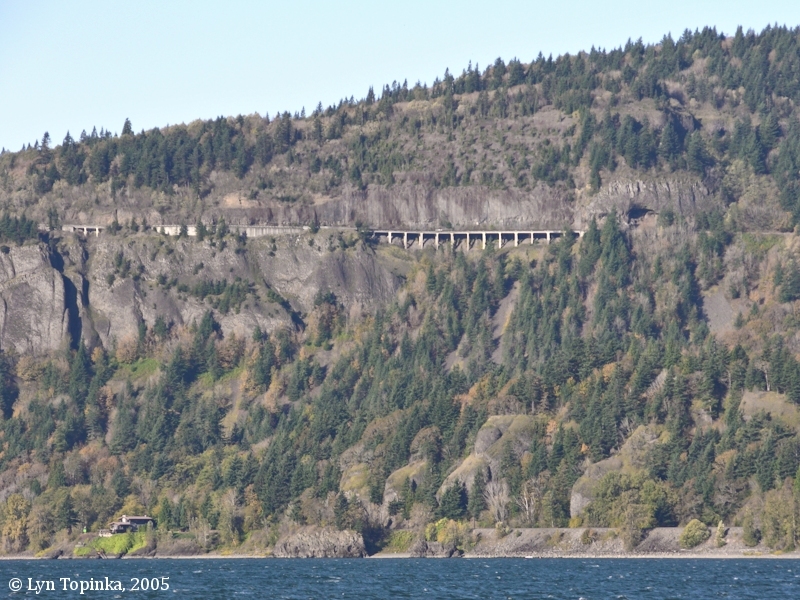 Click image to enlarge Washington State Highway 14 Tunnel No.2, as seen from Mitchell Point. Railroad Tunnel No.3 is not visible behind the trees. View of the west portal. Image taken June 4, 2005. Click image to enlarge West Portal, Tunnel No.2, Washington State Highway 14. Image taken May 1, 2005. Click image to enlarge West Portal, "Blum Tunnel", Railroad Tunnel No.3. Image taken May 1, 2005. 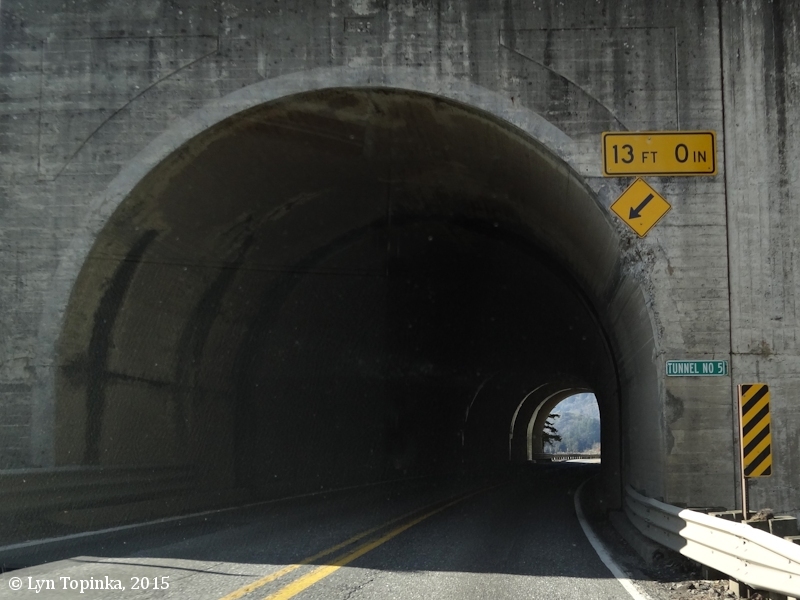 Washington State Highway 14 Tunnel No.3 is at the east end of Tunnel Lake. 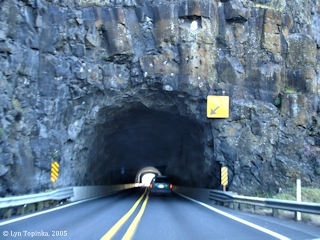 It is paired with Railroad Tunnel No.4, the "Severson Tunnel". The Severson Railroad Tunnel is 267 feet long. Remnants of the Broughton Log Flume are visible on the slope above these tunnels. 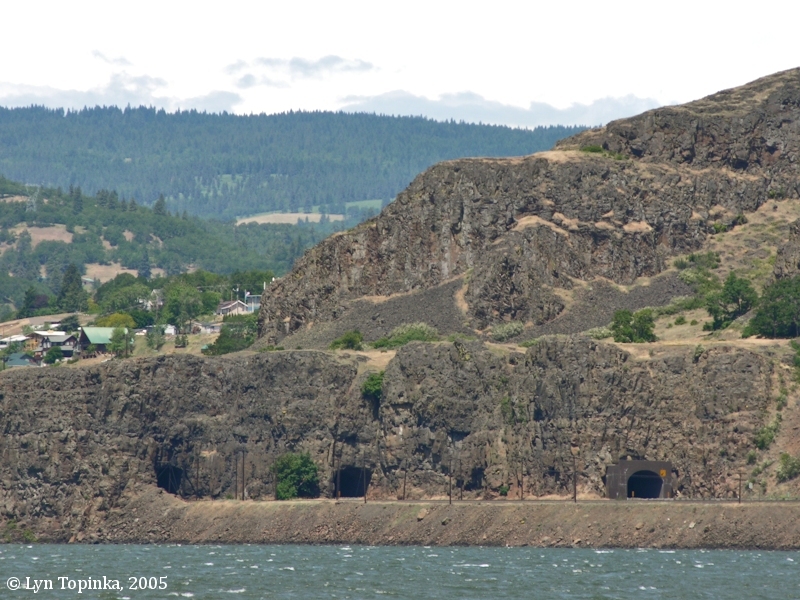 These tunnels can be seen from across the Columbia River at Oregon's Mitchell Point. 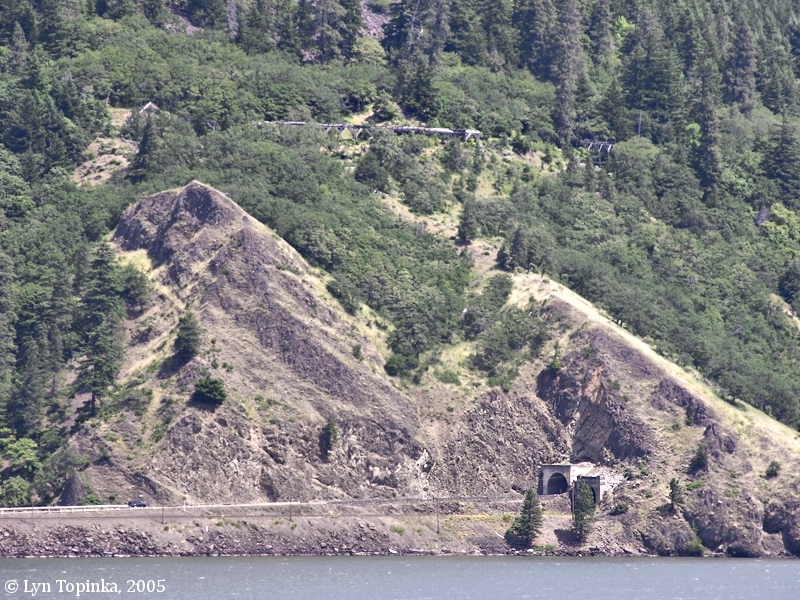 Click image to enlarge Washington State Highway Tunnel No.3 (Railroad Tunnel No.4 just visible behind tree) from Mitchell Point. Part of the Broughton Log Flume is visible on the slope above. View of the west portals. Image taken June 4, 2005. 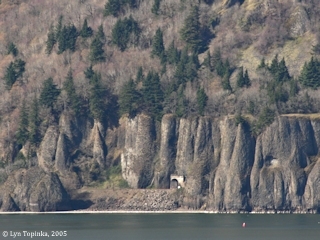 Click image to enlarge West Portals, Washington State Highway Tunnel No.3 and Railroad Tunnel No.4. Image taken June 4, 2005. 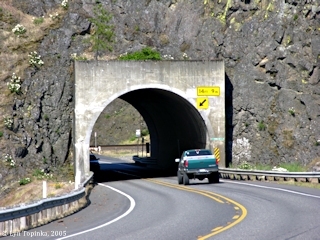 Click image to enlarge East portal, Washington State Highway 14 Tunnel No.3. Note Tunnel No.2 visible through Tunnel No.3. Image taken June 4, 2005. 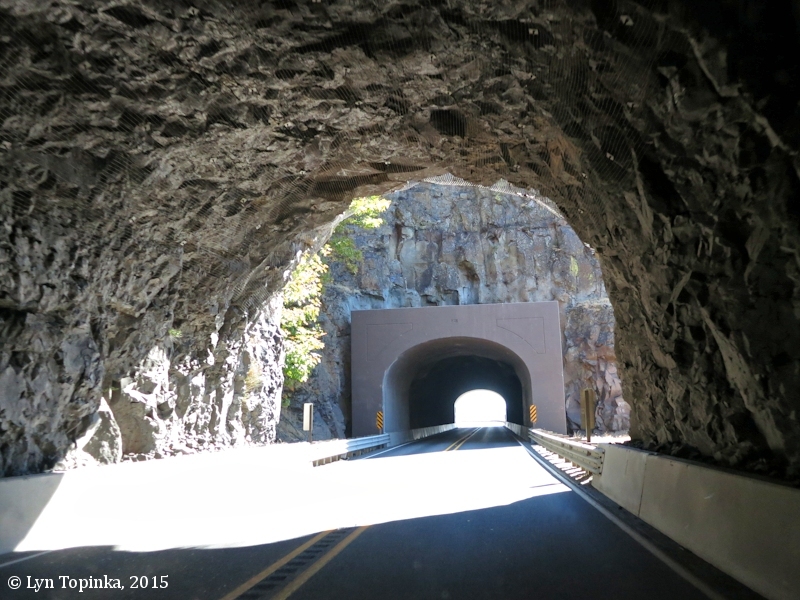 Washington State Highway 14 Tunnel No.4. 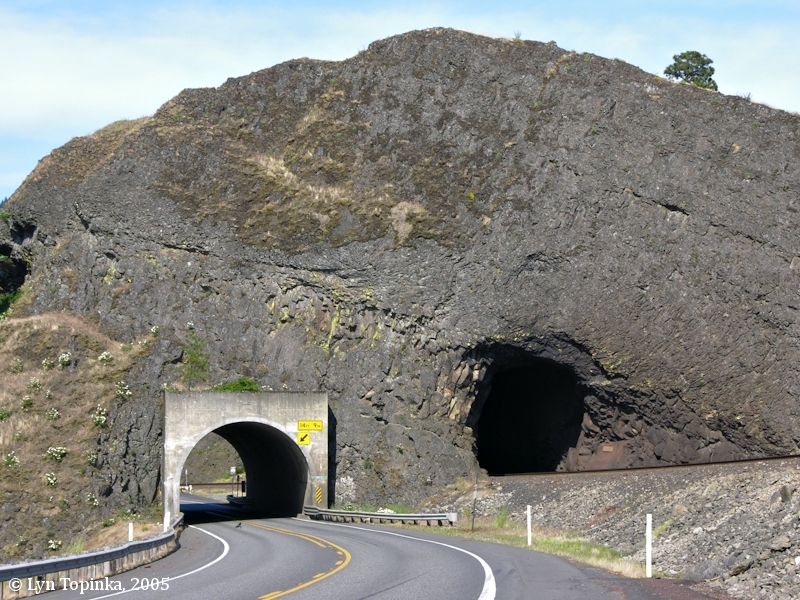 The railroad tunnel at this point is Tunnel No.5 and is called the "Owl Rock Tunnel". It is 394 feet long. 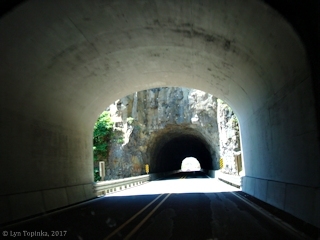 Click image to enlarge West Portal, Washington State Highway 14 Tunnel No.4. View of the west portal. Image taken June 4, 2005. 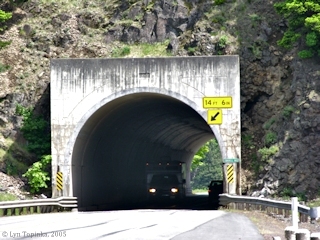 Click image to enlarge West Portal, Washington State Highway 14 Tunnel No.4. Image taken June 4, 2005. Click image to enlarge East portal, Washington State Highway 14 Tunnel No.4. Image taken June 4, 2005. 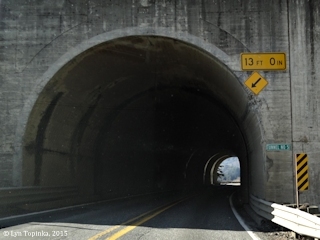 Washington State Highway 14 Tunnel No.5 is the last of the grouping of five tunnels in a row. It is paired with Railroad Tunnel No.6, the "Alligator Rock Tunnel". This railroad tunnel is 657 feet long. Click image to enlarge West Portals, Washington State Highway 14 Tunnel No.5 and Railroad Tunnel No.6. Image taken June 4, 2005. Click image to enlarge East portals, Washington State Highway 14 Tunnel No.5 and Railroad Tunnel No.6. Image taken June 4, 2005. 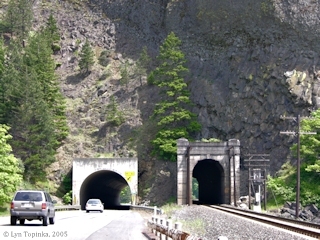 Click image to enlarge East portal, Washington State Highway 14 Tunnel No.5. Image taken June 4, 2005. The 392-foot-long "Woldson's Tunnel", Railroad Tunnel No.9, lies downstream of Chamberlain Lake. 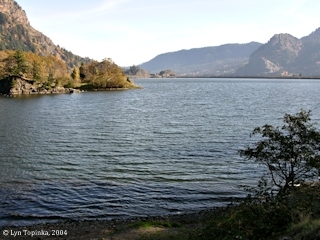 The west portal can be viewed from the Chamberlain Lake Rest Area. Heading east the tracks exit the tunnel and cross the causeway separating Chamberlain Lake from the Columbia River. Click image to enlarge West Portal, "Woldson's Tunnel", Railroad Tunnel No.9, at Chamberlain Lake. View from the Chamberlain Lake Rest Area. Image taken June 4, 2005. Click image to enlarge West Portal, Railroad Tunnel No.9, at Chamberlain Lake. View from the Chamberlain Lake Rest Area. Image taken June 4, 2005. 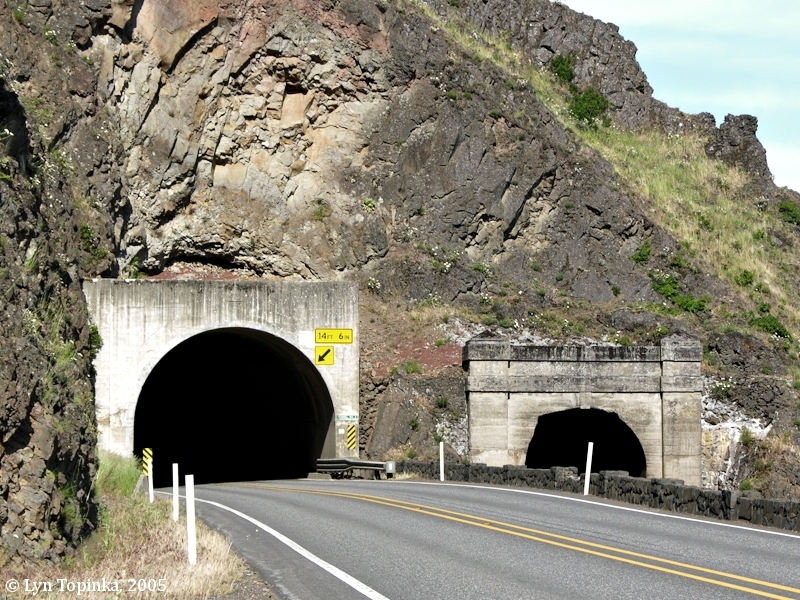 Washington State Highway 14 Tunnels No.6 and No.7 and Railroad Tunnel No.11 are immediately east of Klickitat River and Lyle, Washington. Railroad Tunnel No.11 is 269 feet. 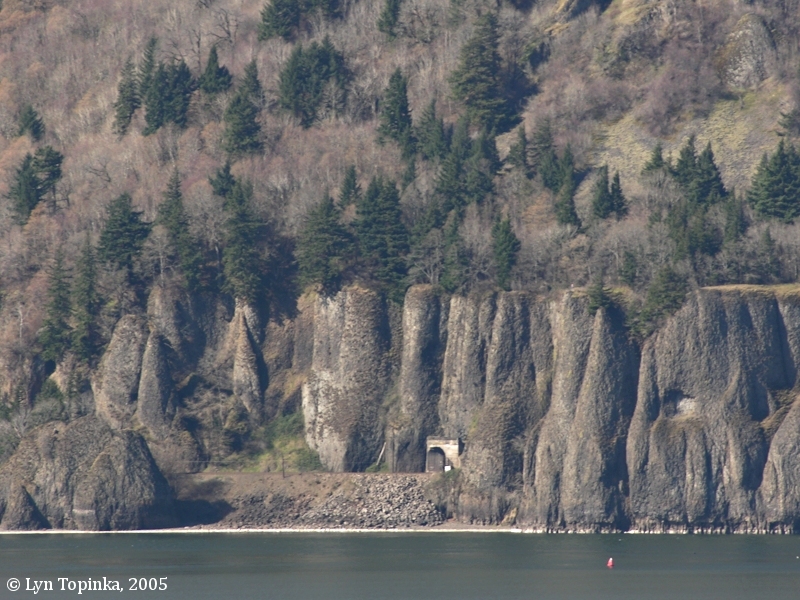 The eastern portals of these tunnels can be seen from Mayer State Park on the Oregon side of the Columbia River. 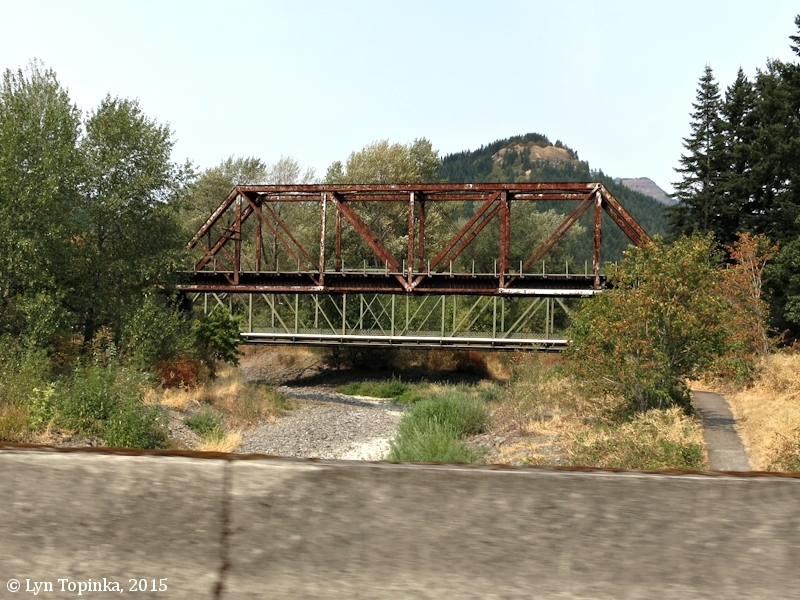 Click image to enlarge Washington State Highway 14 upstream of Lyle. 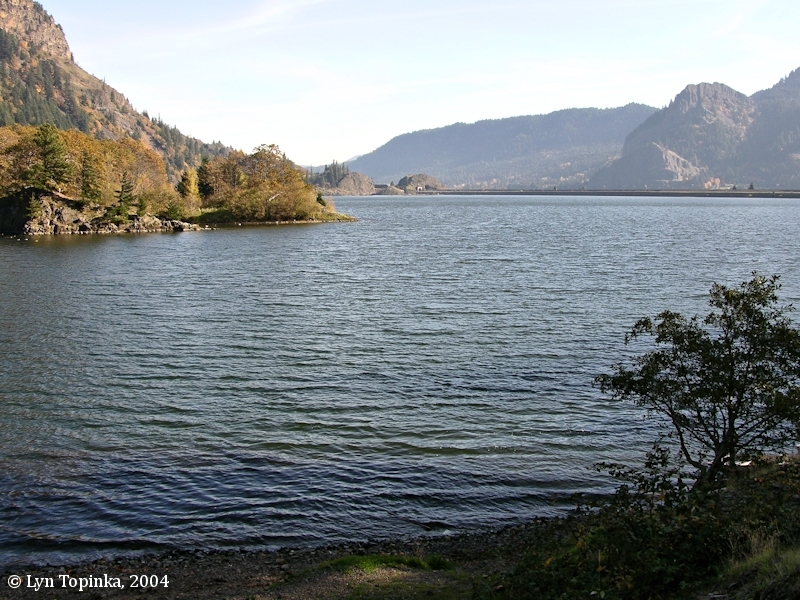 View from Mayer State Park, Oregon, looking at Washington State Highway 14, upstream of Lyle. View shows the eastern portals of three tunnels. 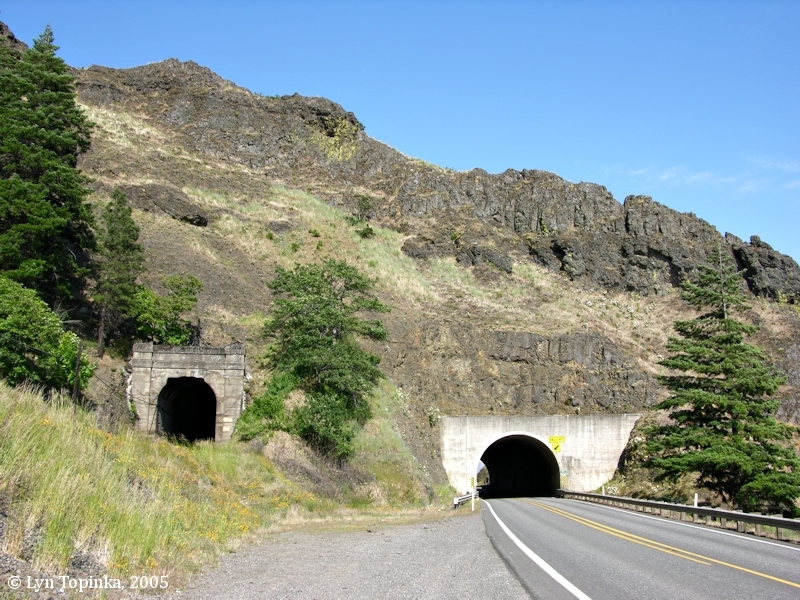 Left to right: Railroad Tunnel No.11, Washington State Highway 14 Tunnel No.6, and Washington State Highway 14 Tunnel No.7. Image taken June 4, 2005. 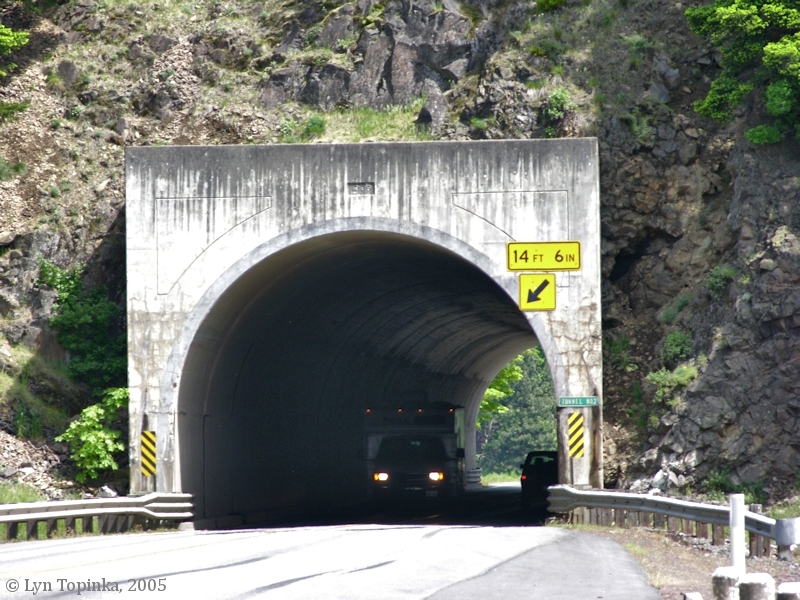 Click image to enlarge West Portal, Washington State Highway 14 Tunnel No.6. Tunnel No.6 is upstream of Lyle, Washington. Light in middle of tunnel is space between Tunnel No.6 and Tunnel No.7. Image taken May 24, 2005. Click image to enlarge West Portal, Washington State Highway 14 Tunnel No.7.. Tunnel No.7 is the second tunnel upstream of Lyle, Washington. Image taken May 24, 2005. Click image to enlarge West Portal, Washington State Highway 14 Tunnel No.7. 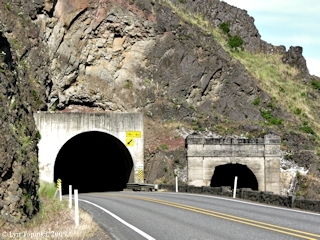 Tunnel No.7 is the second tunnel upstream of Lyle, Washington. Image taken September 26, 2015. 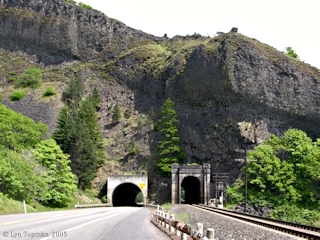 Click image to enlarge East Portal, Washington Highway 14 Tunnel No.7, just east of Lyle, Washington. Image taken September 26, 2015. 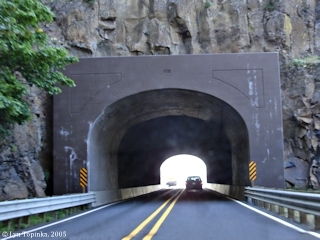 Click image to enlarge East Portal, Washington Highway 14, Tunnel No.6, just east of Lyle, Washington. In Tunnel #7 looking at east portal of Tunnel #6. Image taken June 4, 2011. Click image to enlarge Tracks at Lyle and west portal, BNSF Railroad Tunnel No.11, looking upstream (east), from bridge over tracks, Lyle, Washington. Image taken June 4, 2011. Click image to enlarge West Portal, BNSF Railroad Tunnel No.12, Wishram, Washington. Overcast gray day. Image taken October 15, 2011.